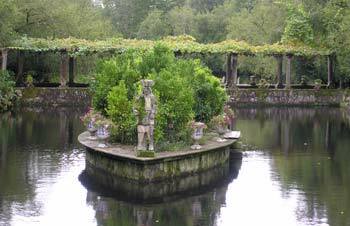 ABOVE: A statue guards a boatlike island in the Pazo de Oca's pond. A garden with oaks and cypresses. In the countryside around Santiago de Compostela, two such pazos are open to visitors: the Pazo de Oca near Ourense, and the Pazo Santa Cruz de Rivadulla close by. Both are worth seeing if you're a gardening enthusiast, and one--the Pazo de Oca--deserves a visit even if your hobbies don't include horticulture.